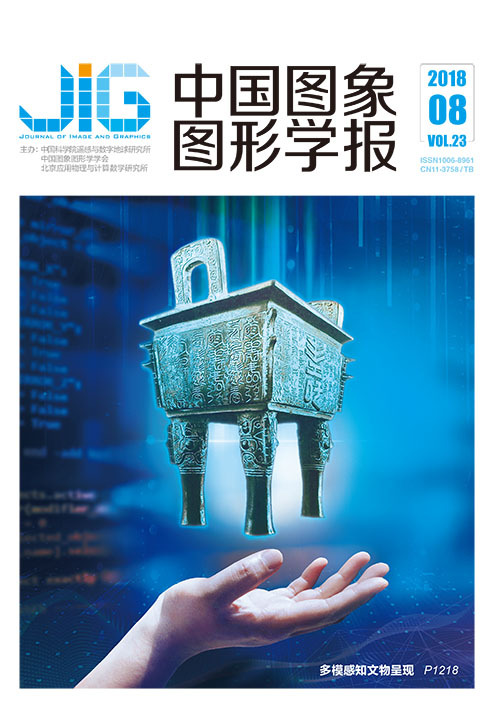 徐贵力, 男, 教授, 主要研究方向为车辆识别, 图像识别。E-mail: guilixu@nuaa.edu.cn. Objective Face images collected from real people are usually influenced by environmental factors, such as illumination and occlusion. In this situation, face images from the same class have varying degrees of otherness, and face images from different classes have distinct degrees of similarity, which can greatly affect the accuracy of face recognition. To address these problems, a face recognition algorithm for discerning structured low-rank dictionary learning is put forward and it is based on the theory of low-rank matrix recovery. Method The proposed algorithm adds low-rank regularization and structured sparse to discern dictionary learning based on the label information of training samples. During dictionary learning, the proposed algorithm first adopts the reconstruction error of training samples to constrain the relationships between training samples and the dictionary. The algorithm then applies Fisher discrimination criterion to the coding coefficients of dictionary learning for the coding coefficients to maintain discrimination. The proposed algorithm also applies low-rank regularization to the dictionary on the basis of the theory of low-rank matrix recovery because the noise in the training samples can influence the discrimination of the dictionary. During dictionary learning, structured sparse is imposed to avoid losing structure information and guarantee optimal classification of samples. Finally, test samples can be classified on the basis of reconstruction error. Result Experiments regarding the proposed algorithm are performed on the AR and ORL face databases. 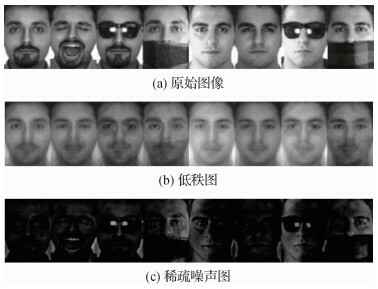 In the AR face database, to analyze the effects of experimental results from the different dimensions of samples, training samples include six images in the first session, that is, one scarf occlusion image, two sunglasses occlusion images, and three facial expression change and illumination change images per person. Test samples are the same as training samples. Face recognition is higher as face image dimension is higher in any method. Comparing the face recognition rate of sparse representation based on classification (SRC) algorithm with that of discriminative KSVD (DKSVD) algorithm, DKSVD algorithm reduces the effects of recognition results from uncertain factors in training samples by dictionary learning. Comparing the face recognition rate of discriminative low-rank dictionary learning for sparse representation(DLRD_SR) algorithm with that of Fisher discriminative dictionary learning (FDDL) algorithm, the low-rank regularization of dictionary can improve the face recognition rate by at least 5.8% when images show noise information such as occlusion. Comparing the face recognition rate of the proposed algorithm with that of DLRD_SR algorithm, face recognition rate can be improved noticeably when Fisher discrimination criterion is imposed to dictionary learning, and the ideal sparse values guarantee the optimal classification of test samples. The face recognition rate of images of 500 dimensions, in which a part of images is occluded with scarf or sunglasses, is 85.2%. In the AR face database, the occlusion degrees using sunglasses and scarf can be regarded as 20% and 40% of the face image, respectively. To verify the validity of the proposed algorithm in different facial expression and illumination changes and with scarf and sunglasses occlusion, experiments are performed according to specific image combinations of training samples. In any image combination, the proposed algorithm exhibits prominent superiority in face recognition when the face images are occluded. In training samples of images containing only facial expression and illumination changes and sunglasses occlusion, the recognition rate of the proposed algorithm is higher than that of other algorithms by at least 2.7%. In training samples of images with only facial expression and illumination changes and scarf occlusion, the recognition rate of the proposed algorithm is higher than that of other algorithms by at least 3.6%. In training samples of images showing facial expression and illumination changes and sunglasses and scarf occlusions, the recognition rate of the proposed algorithm is higher than that of other algorithms by at least 1.9%.In the ORL face database, the face recognition rate of images without occlusion is 95.2%, which is slightly lower than the recognition rate of FDDL algorithm. When the degree of random block occlusion of face images increases up to 20%, the face recognition rate of the proposed algorithm is higher than SRC, DKSVD, FDDL, and DLRD_SR algorithms. When the degree of random block occlusion of face images increases up to 50%, the face recognition rates of the aforementioned algorithms are all low, whereas that of the proposed algorithm remains the highest. Conclusion The proposed algorithm features certain robustness when face images are influenced by different factors, such as occlusion. Results also show that the proposed algorithm possesses feasibility for face recognition. Yang M, Zhang L. Gabor feature based sparse representation for face recognition with Gabor occlusion dictionary[C]//Proceedings of DaniilidisK, Maragos P, ParagiosN. Computer Vision-ECCV 2010. Berlin: Springer-Verlag, 2010: 448-461. Kuo H J, Liu Y C, Cheng Y C. Image processing system and method of improving human face recognition: US, 9133526 B2[P]. 2016-04-12. Ramirez I, Sprechmann P, Sapiro G. Classification and clustering via dictionary learning with structured incoherence and shared features[C]//Proceedings of IEEE Conference on Computer Vision and Pattern Recognition. San Francisco, CA: Institute of Electrical and Electronic Engineers, 2010: 3501-3508. Wang J, Cai J F, Shi Y H, et al. Incoherent dictionary learning for sparse representation based image denoising[C]//Proceedings of IEEE International Conference on Image Processing. Paris, France: Institute of Electrical and Electronic Engineers, 2014: 4582-4586. Zhang Q, Li B X. Discriminative K-SVD for dictionary learning in face recognition[C]//Proceedings of IEEE Conference on Computer Vision and Pattern Recognition. San Francisco, CA: Institute of Electrical and Electronic Engineers, 2010: 2691-2698. Jiang Z L, Lin Z, Davis L S. Learning a discriminative dictionary for sparse coding via label consistent K-SVD[C]//Proceedings of IEEE Conference on Computer Vision and Pattern Recognition. Providence, RI: IEEE, 2011: 1697-1704. Yang M, Zhang L, Feng X C, et al. Fisher discrimination dictionary learning for sparse representation[C]//Proceedings of IEEE International Conference on Computer Vision. Barcelona, Spain: Institute of Electrical and Electronic Engineers, 2011: 543-550. Ma L, Wang C H, Xiao B H, et al. Sparse representation for face recognition based on discriminative low-rank dictionary learning[C]//Proceedings of IEEE Conference on Computer Vision and Pattern Recognition. Providence, RI: Institute of Electrical and Electronic Engineers, 2012: 2586-2593. Zhang Y M Z, Jiang Z L, Davis L S. Learning structured low-rank representations for image classification[C]//Proceedings of IEEE Conference on Computer Vision and Pattern Recognition. Portland, OR: Institute of Electrical and Electronic Engineers, 2013: 676-683. Rosasco L, Verri A, Santoro M, et al. Iterative projection methods for structured sparsity regularization: MIT-CSAIL-TR-2009-050, CBCL-282[R]. Cambridge, MA: Massachusettes Institute of Technology, 2009. Bertsekas D P. Constrained Optimization and Lagrange Multiplier Methods[M]. New York: Academic Press, 1982. Martínez A, Benavente R. The AR face database: CVC techrep #24[R]. Bellaterra, Barcelona City: Computer Vision Center, 1998. Samaria F S, Harter A C. Parameterisation of a stochastic model for human face identification[C]//Proceedings of the 2nd IEEE Workshop on Applications of Computer Vision. Sarasota, FL, USA: Institute of Electrical and Electronic Engineers, 1994: 138-142.